OMG You Guys! Twelfth Night Productions is presenting LEGALLY BLONDE THE MUSICAL. 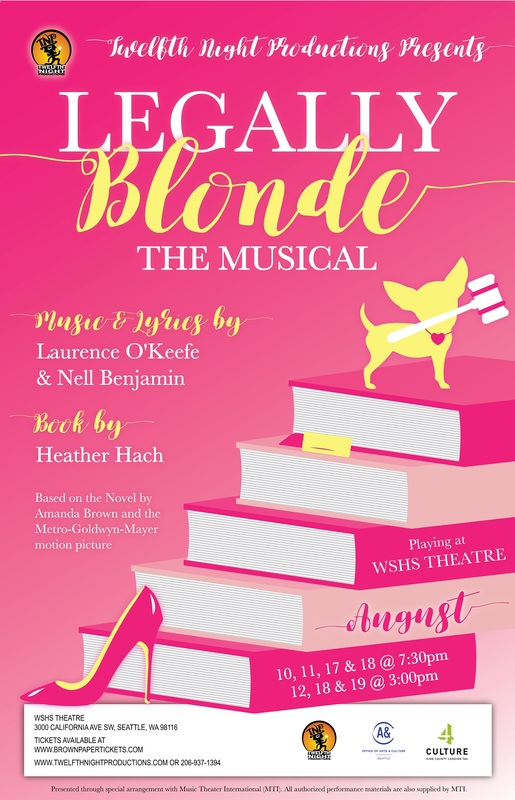 A fabulously fun international award-winning musical based on the adored movie, LEGALLY BLONDE THE MUSICAL follows the transformation of Elle Woods as she tackles stereotypes, snobbery, and scandal in pursuit of her dreams. This action-packed musical explodes on the stage with memorable songs and dynamic dances. Equal parts hilarious and heart-warming, this musical is so much fun, it should be illegal! Playing August 10, 11, 17 and 18 at 7:30 pm and August 12, 18 and 19 at 3:00 pm at WSHS Theater, 3000 California Ave SW.
Tickets are available at Brown Paper Tickets or at the box office at West Seattle High School an hour before show time. Prices are $24 for adults and $20 for students & seniors.